There are definitely many different kinds of receipt and you have probably seen a number of them already. But there is this one receipt you don’t always come across on a daily basis, nor can you get one from stores, hardware or groceries. So let me ask you, have you ever heard of a transfer receipt? Have you seen one before? Lucky or you if your answers are both yes’. Well, you really don’t have to panic if you do not have any idea on what a transfer receipt it. It is because in this article we will be providing transfer receipt samples and templates, as well as discuss many things to learn about it. 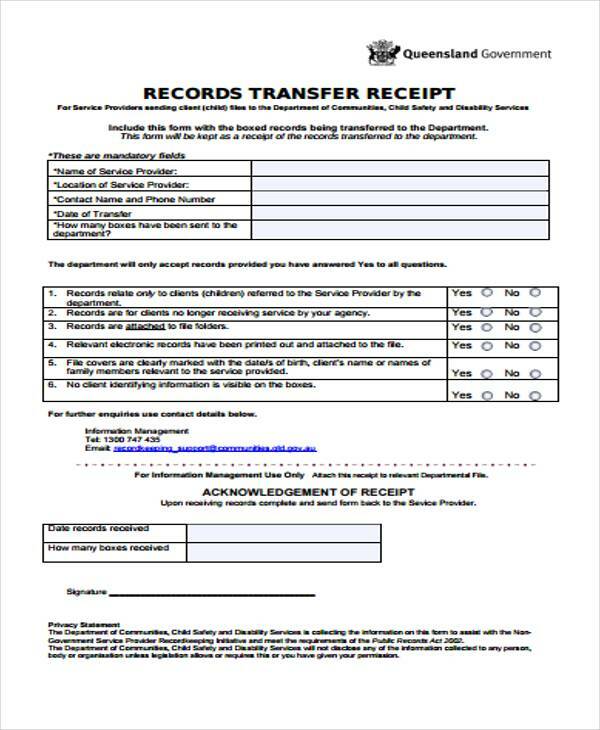 We will define what a transfer receipt is, its uses, why receipts are important and many more. You may check out the sample receipts below! 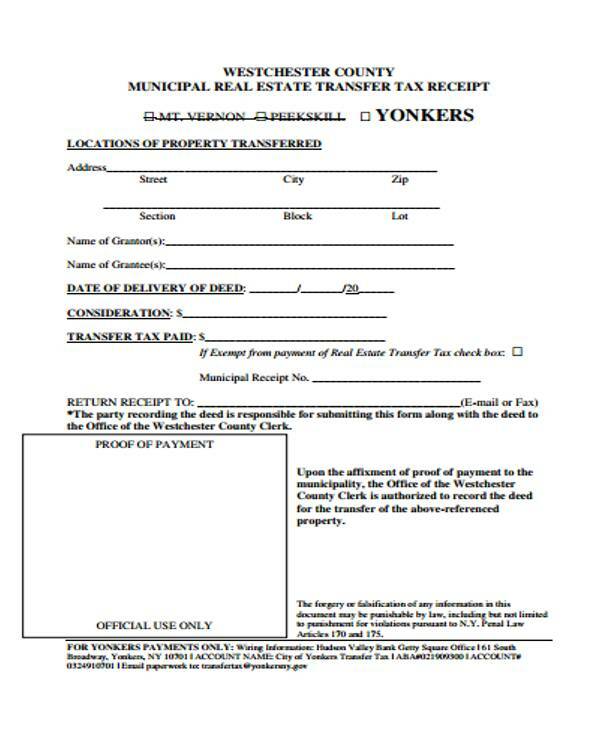 What Is a Transfer Receipt? The usual type of receipt that we know of are those that can be acquired or issued after making a payment for the goods or services purchased at establishments or shops. They serve as a proof that the goods and services has been paid for and you know own those goods. A transfer receipt works the same way with a few differences. It is still a receipt and is issued and used just like a receipt except that it cannot be acquire or issued in stores and other establishments. 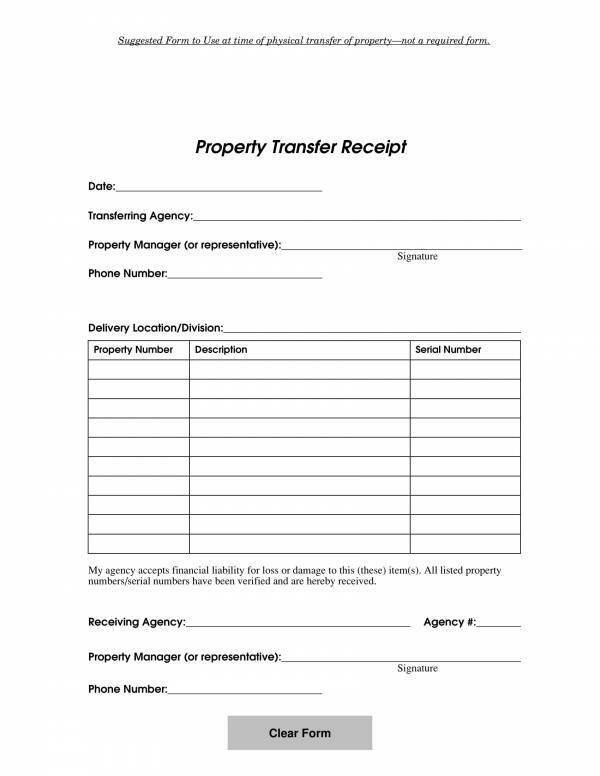 A transfer receipt is defined as a type of document that contains essential information about a transaction where both the buyer and the seller of such products exchange mutual consent. The transaction is about a transfer of a particular possession, like legal documents, vehicles, real estate properties and other forms of properties. Compared to your usual purchase receipts or credit card receipts, transfer receipts have a more complicated format and it also includes more information. 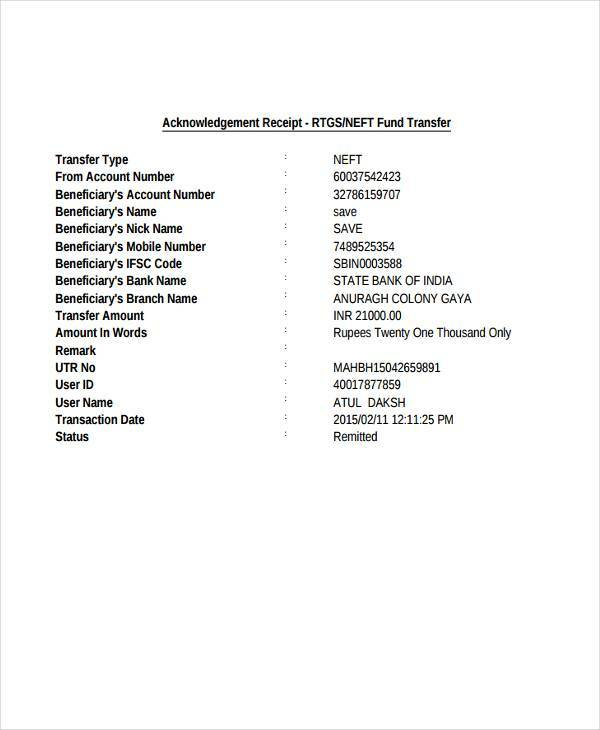 There are also transfer receipts that are used for simple transactions and with a simple format. 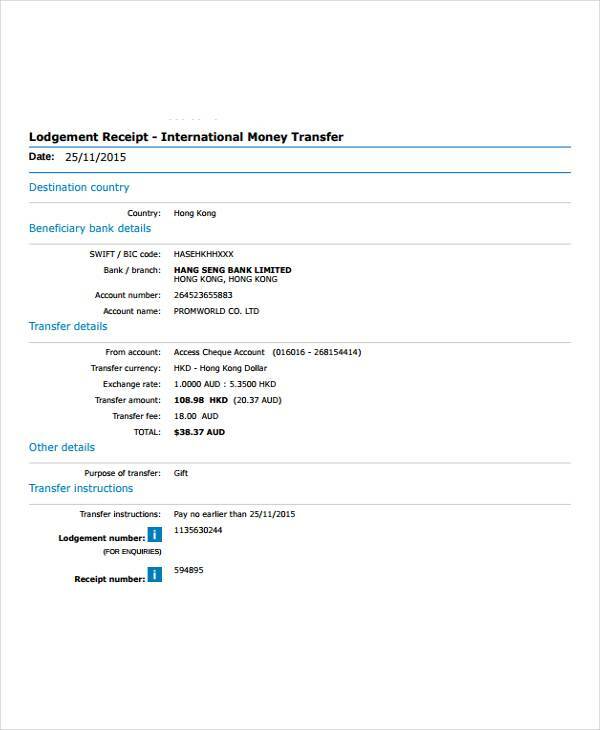 An example would a cash transfer receipt or a money transfer receipt. 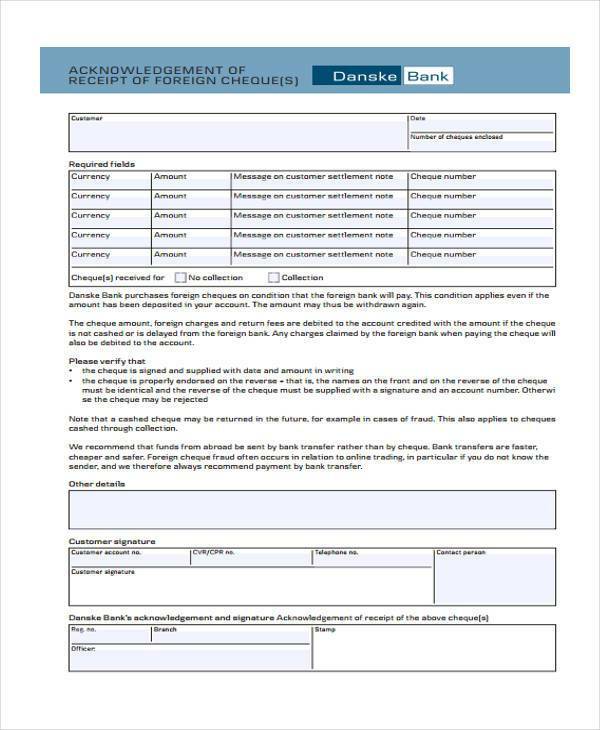 Sending money to another country or state has been difficult before and a lot of forms and documents need to be filled out. But with the evolution of technology and the industrialization of a lot of things, the money transferring process is now made simple and easy. 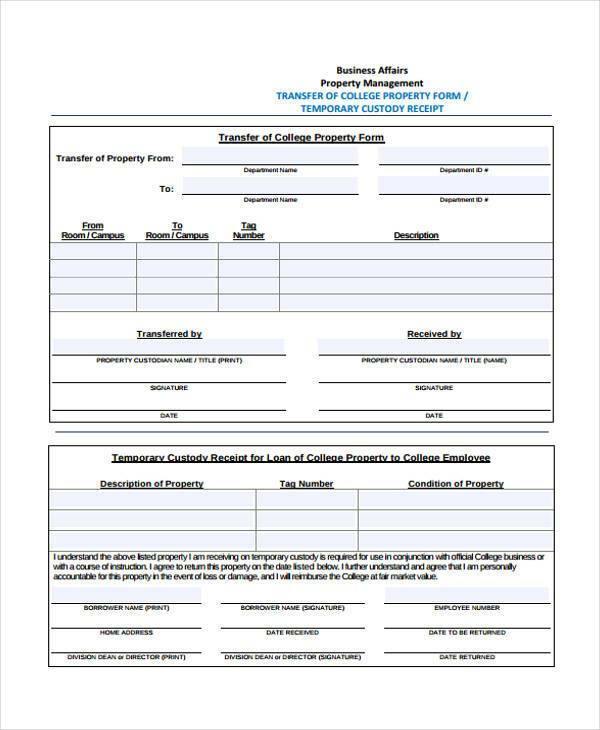 Other receipt related articles you may also want to check out are Petty Cash Receipt Samples & Templates, Parking Receipt Samples, and Printable Payment Receipts. What Are the Types of Receipts? Receipts are basically issued after payment is made and this is practiced in different establishments offering goods and services to a variety of clients. There are actually three main types of receipts that are being used by business establishments and they are printed receipts, electronic receipts and handwritten receipts. Let us take a look at each of these types. 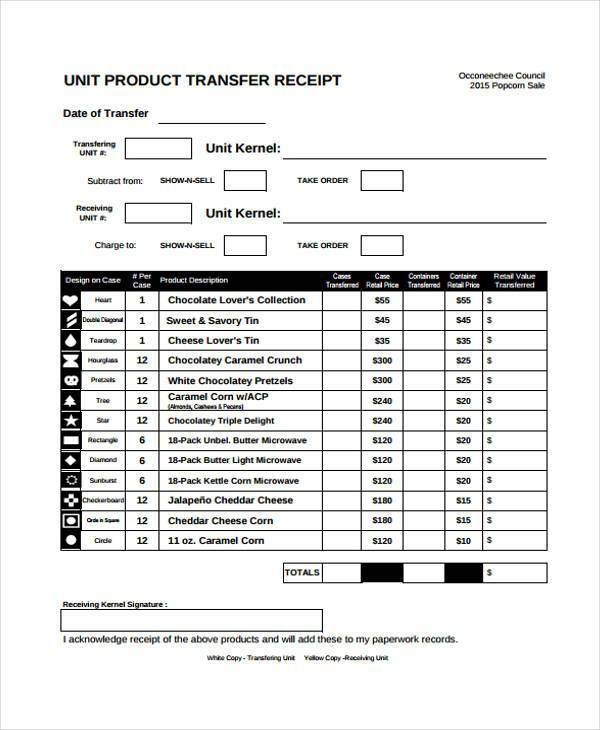 Printed receipts – These are the receipts that you get from grocery store purchases or from shopping malls. They are issued to you right after you make the payment at the cashier. Convenience stores, restaurants, stalls in the mall and boutiques are some of the establishments that issue printed receipts. In addition, credit card receipts are also considered printed receipts as you get an actual copy after the amount has been deducted on your card. 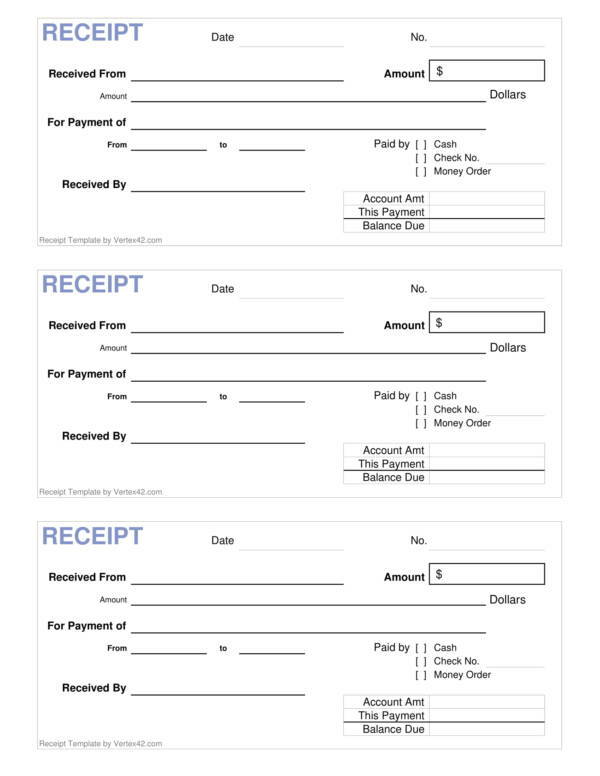 Electronic receipts – This type of receipt has been around for some time now but it became more common with the advancement of technology, when it became pretty easy to connect to the internet and when a lot of people started having their own email addresses. 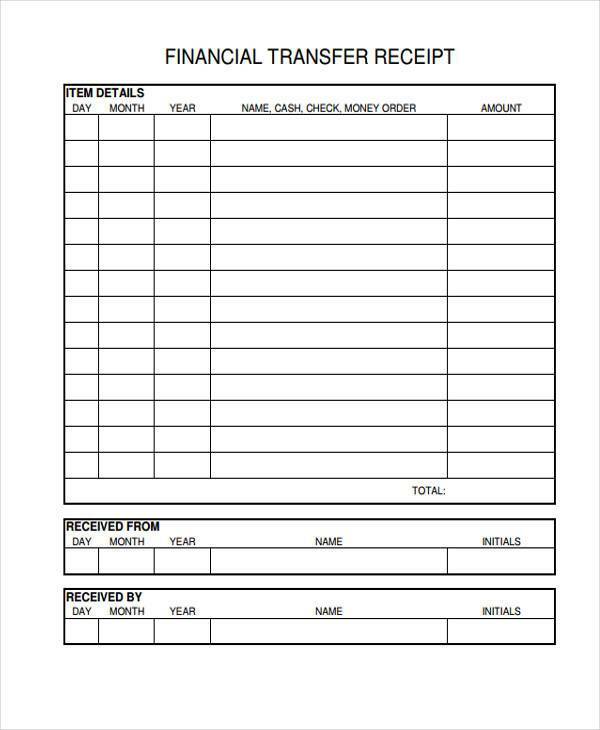 The use of electronic receipts became really popular when environmental advocacies started. A lot of people switched to paperless receipts and paperless billing to lessen paper waste and save the tress. Instead of issuing a printed receipt, the receipt for the transaction is sent to the email address that the customer provided. Some establishments offer only this option, while in other establishment customers can choose whether to have a printed receipt or an electronic receipt. Handwritten receipts – No computer and no printer? No problem! Even with the technological advancement we are experiencing today, handwritten receipts are still in use. 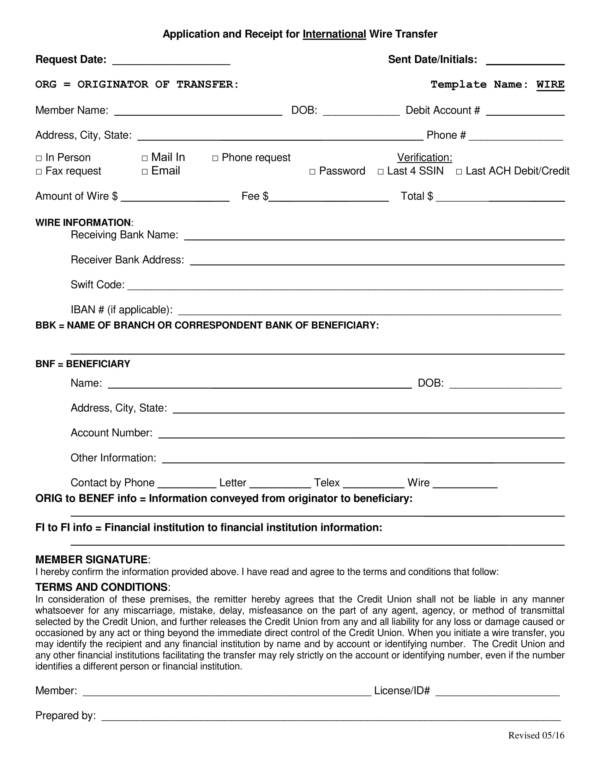 This is often preferred over printed and electronic receipts because it does not need any special device such as computers, printer or cash registries. 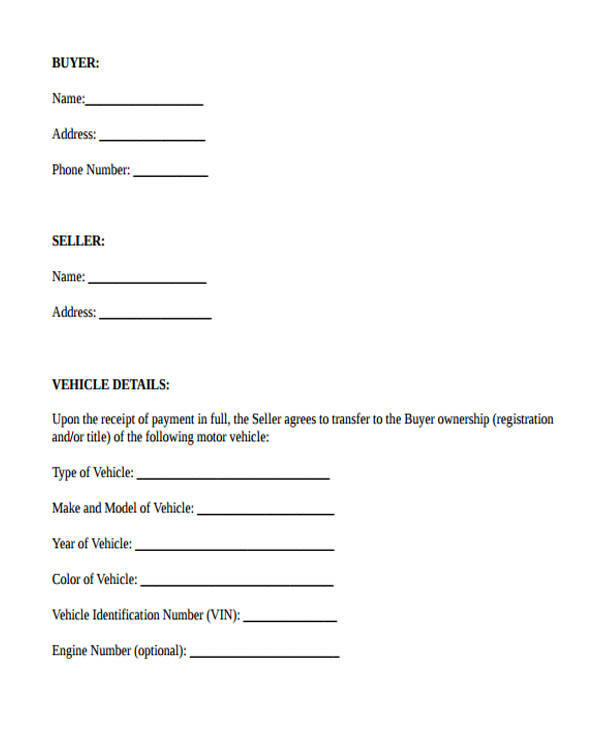 The sellers write down the details of transaction on a receipt template. So, which type of receipt do you prefer the most? Is it the printed type of receipt which is commonly used now? Is it the electronic receipt is sent to your email where you can easily find whenever you need to? Or is it the traditional handwritten receipt where you not only see the handwriting of the seller, but it also includes your signature and their signature? Whichever type of receipt it is, just make sure that is includes all the necessary details of the transaction that are required in case of a refund or product exchange. Other related article that you may find interesting are Sample Business Tax Receipts, Sample Cleaning Service Receipts, and Bill of Sale Receipt Samples. The following are the reasons why receipts are considered important. Receipts serve as your proof of purchase which means that what you bought has already been paid and that ownership of those products are already transferred to with your receipt as evidence. A receipt is necessary when you need to return a product and request for a refund, or when you need to have it replaced with something else. Receipts include the tax percentage and the tax amount that you are paying. You can get a tax refund simply by keeping all your receipts and then presenting them during your tax declaration. With the use of receipts, you can keep track of your expenses that will help you stay within your budget. It is important that businesses issue receipts as this is one way of saying that they are legally operating their business and that they are paying their tax dues. Receipts are very useful in case your business get audited. Having a complete and detailed copy of receipts will save you from answer all those audit questions you never want to answer. A receipt contain critical information that your bookkeeper needs when you work with one. Keeping a record of all your receipts allows you to monitor how your business had been doing, if it is gaining progress or not. Receipts are also a great help in the preparation of financial statements and tax returns. Receipts are important because they serves as a supporting document on your tax returns. They also help in keeping track of your expenses and identifying your sources of income. 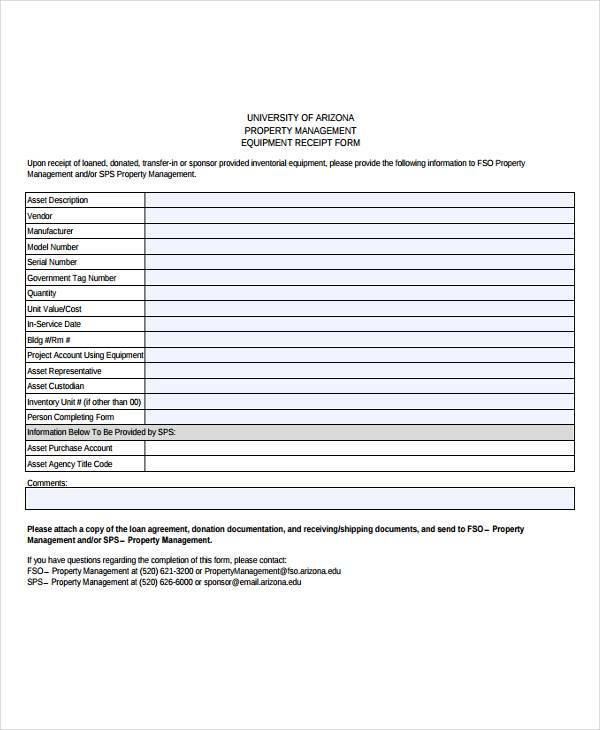 You may also wan to check out titles, like Sample Car Service Receipts, Sample Rent Deposit Receipts, and Sample House Rent Receipts. Most of us assume that receipts and invoices are the same. We get them from the same purchases, from the sames stores and for the same products. So there is really no need to differentiate them as they have no differences. Truth is, there have quite a lot of differences that has been around since the day they were created. So how are they different? Let’s go ahead and find out. The distnct and most obvious difference that sets a.receipt apart from an invoice is when they are issued. You surely won’t remember getting them before as you were lead to believe that they are same. Invoices are issued before you have made the required payment for your purchase. Remeber that piece of paper handed to you by the waiter when you asked for your bill? That is an invoice and you thought all along that it’s he receipt. A receipt is that small sheet of paper that pretty much includes the same things that you see in an invoice, except that it is issued after you have made a payment, the mode of payment and how much you paid for. Receipts and invoices definitely have a lot of uses and they are no doubt almost the same. So how can you tell when to use a receipt and when to use an invoice? An invoice is used to request payment for goods or services that one wishes to buy or has already consumed. That is why it is issued before the payment is made. A receipt on the other hand shows proof that payment has been made for the goods.or.services that one has purchased or for what they have consumed. When it says you’re paid, that means you can go out the establishment with all your purchases with no incidents. What does a receipt have that an invoice doesn’t? A lot actually. These things are often taken for granted all of the time that is why you don’t know these differences even exist. But they do. Let’s check out the list below. In a receipt, you will most likely be able to see the mode of payment used, whether it is through cash, debit card, credit card, or gift card. This information is not available in an invoice as payment has not been made yet. In an invoice, the payment agreement is specified. Payment agreements are arrangements about how the sale transaction can be paid. Both seller and buyer agree to the terms and conditions of the agreement before it can be approved. The signature and name of the seller and buyer are affixed on the invoice, especially if they have agreed to a payment arrangement. This is very important as this serves as a legal document to ensure that both parties agree to the terms and conditions. A unique invoice number, which is usually a combination of numbers and letters is part of an invoice, while a receipt also has its own unique receipt number. 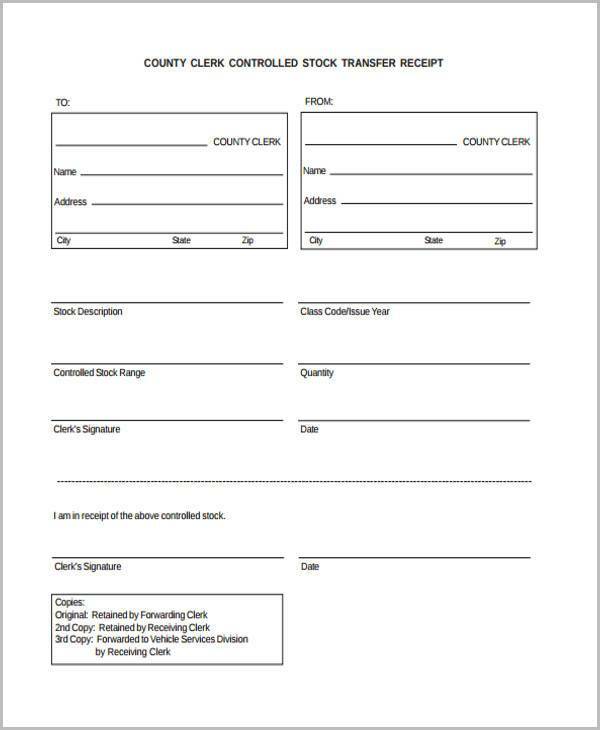 An invoice contains more information about the buyer such as their address, age or date of birth. The differences are obvious and easy to remember. So the next time you see them, you will surely know how they are different. You may check out articles, like Sample Advance Payment Receipts, Bill Receipt Samples and Templates, and Travel Receipt Samples and Templates, to learn more about receipts. You can easily find them on our website.